We lived many years in Charlotte, NC, and benefited from a well-run municipal potable water treatment and distribution system. Some folks turn up their noses at muni water supplies and prefer bottled water or well water, perhaps without investigating the difference in qualities. Public water systems maintain stringent monitoring, process controls, and reporting to meet or exceed mandatory EPA guidelines (FDA standards for bottled water are far different from EPA’s tap water standards, according to NRDC). There are, of course, always exceptions but, given a highly regulated water source and an essentially unregulated one, we’ll generally stick with the EPA-regulated water source. Full-timers may be less familiar with local water supplies than home owners and sometimes this can matter significantly. Have you ever considered asking the local tap water supplier about the water quality? Shouldn’t you know if the park is under a boil-water condition, or “the water is okay but no one drinks it”? Wouldn’t you like to know what you’re drinking? And we learned at one park, “The well water is untreated.” We needed to fill our potable water tank, but didn’t want to store untreated water in it. Cleaning the interior of a water storage tank is much more difficult than keeping it clean. Or do you believe what you don’t know won’t hurt you? You can’t see in the tank, and the gradu isn’t showing up in your ice trays so everything is okay. Wrong. How do we maintain our RV’s potable water system? We provide the following not as a prescription for your use, nor as a superlative to anyone else’s methods. The following is what we have done for the past five years. We wish we could show you a picture of the inside of our tank (or maybe we shouldn’t be looking in there anyway). > We keep our fresh water tank full as much as we reasonably can. We can treat what is under the water line, we cannot treat above the water line. Air space above the water line is space for growing stuff on the tank walls. Keep the tank full most of the time. > We change the fresh water on a regular basis, even if we haven’t used it. Water treatment is our friend (many people will argue this, but this is about us) and inhibits organic growth in our fresh water tank. Chlorine treatment doesn’t persist in stored water. > We don’t put untreated water into our potable water tank. If the park offers only untreated water then we’ll treat it during the tank filling (more on this later). We don’t have a nifty siphon pickup attachment for our fresh water (white) hose. Instead we use a piece of NSF grade clear tubing two feet long to siphon from a one quart container of the bleach and water solution. We mix the solution following guidelines for emergency treatment of drinking water from EPA. We found a helpful link to system cleaning procedures as well as normal chlorination here. We also have used guidelines from an EPA document, emergency disinfection drinking water. The EPA guidelines are similar to what Jim followed in treating institutional potable storage tanks in his previous lifetime. An interesting side note comes from monitoring our drinking water pitcher. This pitcher is clear plastic and sits upon our counter-top. The pitcher holds almost a gallon of drinking water and receives artificial light or indirect sunlight all day. The pitcher has an integral filter cartridge. And, within three to four weeks, we start seeing green film in the pitcher. The filter’s advertisements claim, “Lowering levels of sediment and chlorine–evident to the nose and mouth–enhance water taste while health concerns are addressed by reducing copper, mercury, and up to 98% of lead commonly found in tap water” (Amazon ad). Relevant in this discussion is the reduction of chlorine in the water. No algae inhibitors, so here grows the stuff! We thoroughly wash our pitcher every three or four weeks when we notice visible green in the bottom of the pitcher. Can you wash your RV’s fresh water tank so easily, and how do you know when to do so? We mentioned earlier, we cannot readily see inside our fresh water storage tank and aren’t sure we really want to. [I think I’ve seen some pictures of old potable water tanks removed from RVs — not a pretty site. We couldn’t find them to attach for this article.] We do want to maintain our fresh water tank in a reasonable manner and believe we can do this by following three simple guidelines. > We keep our fresh water tank full as often as we reasonably can. > We change the fresh water on a regular basis (drain and refill at 3-4 week intervals). > We don’t put untreated water into our potable water tank (if the source is untreated, we’ll treat the water while filling our tank). 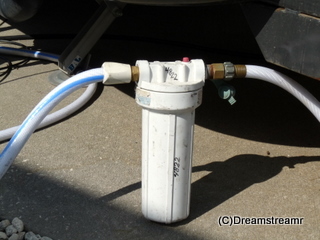 Our RV has an inlet water sediment filter with a large cartridge in a plastic canister. The whole house water filter keeps rocks and other debris from clogging our valves and faucets. We mentioned above we also use a Brita water filter for our drinking water. We do not use bottled water and don’t buy water (RO or other processes). Whenever we stay in an area for a few days we become accustomed to the local water “flavor”. Filtered through our counter-top pitcher, the water makes good tea and is fine in our re-usable water bottles. Why incur additional costs (and increases of disposable plastics to waste dumps) of bottled water? Or dumping quarters or dollars in the RO water dispensers? We believe we are providing safe and sufficient quality water for our uses with the above steps. This has worked for us. What do you do?